Stephen Harper was a 15-year-old student in Etobicoke’s Richview Collegiate just west of Toronto when MacMillan Bloedel chairman Jack Clyne and other corporate leaders chipped in a total of $75,000 to start the Fraser Institute in 1974. Obviously, they didn’t have a Stephen Harper government in mind when they helped MacBlo vice president Patrick Boyle and economist Michael Walker establish Canada’s first libertarian think tank. But perhaps they were persuaded by the famous memo to the U.S. Chamber of Commerce written by soon-to-be Supreme Court Justice Lewis Powell in which he outlined the need for a business-financed propaganda infrastructure. Success in defending capitalism, he wrote, “lies in organization, in careful long-range planning and implementation, in consistency of action over an indefinite period of years, in the scale of financing available only through joint effort, and in the political power available only through united action and national organizations”. Over time, this machine would hobble activist governments, undo the social and economic advances of the 1950s and ’60s, and put business back in the driver’s seat, Powell predicted. Three decades later, in October 2004, the Fraser Institute held its 30th-anniversary gala celebration–30 years during which business and conservative foundations pumped more than $100 million into Fraser activities; 30 years during which Stephen Harper rose from high school to University of Calgary student to Reform party policy chief to head of the National Citizens Coalition and to leader of the official Opposition. The scene was the glitzy Imperial Ballroom of Calgary’s Hyatt Regency, where 1,200 adoring libertarians, conservatives, and reactionaries paid $300 each to hear four prominent conservative politicians–Ralph Klein, Mike Harris, Preston Manning, and Harper–pay tribute to the Fraser’s success in pushing political thought in Canada to the right, helping make their careers possible. Harper, the ideologue of today, would have been unthinkable as leader as recently as 1983, when Brian Mulroney won the Progressive Conservative leadership. Mulroney’s two most right-wing opponents, John Gamble and Peter Pocklington (a long-time Fraser Institute benefactor and trustee), espoused policies not very different than Harper’s. But together they received only a handful of delegate votes. In 1983, Harper wouldn’t have stood a chance. In 2003, he won handily. Credit the Fraser Institute? Harper probably thinks so. In his videotaped address to the 30th-anniversary crowd, Harper showed off his $45 Fraser Institute silk Adam Smith tie and confirmed he was a big fan of the institute. Like the Fraser, he is dedicated to the ideas of Friedrich Hayek, leader of the Austrian School of economics. Margaret Thatcher was an outspoken Hayek devotee. Hayek urged reducing government intervention in people’s social and economic lives to a bare minimum. No social programs, no environmental or consumer regulation. In Hayek’s world, government officials do not serve the public. Instead, they are self-serving empire builders. As Ronald Reagan said, “government is not the solution to our problem; government is the problem.” There is no public interest, only individuals who seek freedom. Hayek, who became a Fraser Institute adviser, originated the idea of setting up fake scholarly organizations to supply authoritative studies demonstrating the superiority of markets over governments in solving all our problems. Why fake? Because a genuine academic organization would not start with a conclusion and then look for arguments and evidence to support it. Lewis Powell recommended that the chamber of commerce should run the propaganda machine. Instead, business adopted Hayek’s more effective model of dispersed, seemingly independent think tanks echoing each other’s output. Harper studied Hayek as an undergraduate at the University of Calgary and developed his free-market philosophy while working with his long-time political mentor, Tom Flanagan, a U of C political scientist, head of the so-called Calgary School of right-wing academics, Fraser Institute fellow, and Conservative campaign manager in the 2004 election. Just a year after the Fraser’s anniversary, Harper was prime minister and it was payback time. Buried in his first budget was a provision to exempt from capital gains tax donations of stock to charity. Adding this new exemption to the existing tax credit for donations to charities means that the donor pays only 40 percent of the dollars he donates. Taxpayers pick up the rest. The Fraser Institute is a registered charity. Of course, not only the Fraser will benefit from this new exemption. There are many thousands of registered charities in Canada, but only a few are likely to see their funding increase. Expect large endowments to come the Fraser’s way. The institute’s annual budget is $6 million and climbing. Hundreds of newly minted Calgary paper multimillionaires own shares in oil companies that have skyrocketed in value over the past few years. Their shares will continue to rise as long as the government doesn’t apply the provisions of the Kyoto Accord. Now they can help the conservative cause at little cost to themselves. Critics of the Fraser Institute will have to grit their teeth, pay their taxes, and bemoan the fact that they are supporting its work. Promoting charities is in line with another Hayek strategy: starve government and fuel the voluntary sector. Remove as many activities as possible from the public-policy arena and put them in the hands of private charity providers. Let the wealthy elite, not the people, determine Canada’s social and environmental justice policies. While Harper was finalizing his gift to voluntary organizations, the Fraser, perhaps expecting more money to roll in, was setting up a Centre for Canadian-American Relations to promote greater economic integration of the two countries. Harper has often voiced his support for deeper integration. It’s another strategy for reducing the role of government. Leading the centre is Simon Fraser University political scientist Alex Moens, whose work is based on the premise that Canada needs to squeeze into a closer economic partnership with the United States. Expect a flurry of studies from the centre providing “proof” that Canada needs to squeeze closer. The Fraser has churned out books hyping hemispheric integration for 15 years. These studies make the point that Canadian prosperity is a result of trade with the U.S. and the free-trade agreements. If we want more prosperity, we need more integration. A 1996 publication, Money and Markets in the Americas: New Challenges, for instance, advocated a monetary union. 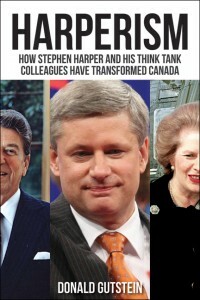 Michael Wilson–Bay Street broker, Brian Mulroney’s minister of finance, and Harper’s ambassador to the U.S.–contributed a chapter. The recently concluded softwood lumber pact may indicate Harper’s route to deeper integration. Harper and George W. Bush were feted by trade officials for pushing through the agreement to end American duties on Canadian lumber and return to Canadian producers 80 percent of the $5.3 billion already collected. Little mentioned is a key clause that requires U.S. government approval of any provincial forest-policy changes. This may be the most significant retreat from sovereignty in recent years, one authored by Harper. The Americans want this provision to ensure that all Canadian forest-policy changes point in one direction only: toward industry-controlled timber pricing. Hayek would cheer from his grave, and the folks at the Fraser were probably cracking open the champagne. Harper’s deal will hobble provincial governments’ ability to tie timber supply and pricing to community economic development and job creation and retention. Harper’s first major foreign appearance was at a meeting of the leaders of the NAFTA countries in March in Cancun, Mexico. While the mainstream media obsessed over Harper’s attire, the three governments were on the verge of taking a giant step toward continental integration. Perhaps he dressed like a goof to divert media attention away from the real story. Over the previous year, government and business leaders from the three countries met privately to organize the agenda for an initiative called the Security and Prosperity Partnership of North America. The goals of the partnership are astonishing: eliminate the border, deregulate the economy, lock Canada’s energy resources into American needs, fashion a unified defence force, and create a new institutional framework for North America. The Cancun meeting introduced this new institution, the North American Competitiveness Council. This organization will comprise members of the private sector from each country and provide government leaders with recommendations (directives?) on North American competitiveness. But it’s not competitiveness as the word used to be known: providing better products and services at lower prices. In this Orwellian world, competitiveness means “regulatory cooperation”, and that means deregulation, a move to limit further the role of government in the economy. The competitiveness council is designed to accomplish on a grand scale what the softwood-lumber pact achieved in one industry: removal of public oversight. On June 13, Harper announced the Canadian members: the heads of Scotiabank, Manulife Financial, Power Corp., Canadian National, Bell Canada, and Suncor Energy–a who’s who of the Canadian corporate elite. Harper’s program is the reactionary right agenda advocated by his Calgary School advisers and the Fraser Institute, but his task is to hide his true intent and pretend to be in the mainstream, which is all the “bewildered herd” can comprehend (as early public relations practitioners thought of the public). In 2003, Harper delivered an important address to the Civitas Society. This secretive organization is a network of Canadian neoconservative and libertarian academics, politicians, journalists, and think-tank propagandists. Harper said his goal is a future ruled by socially conservative values and small government. Movement toward this goal must be “incremental”, he told Civitas members. Regime change one step at a time. That’s likely why he decided not to dismantle Medicare, and, instead, appears to be a defender of the public health-care system, at least until he has his majority. He has to do it this way. Despite a decade of anti-Medicare propaganda from the Fraser and other corporate lobbies, Medicare is still one of our most valued public programs. In a major Fraser Institute publication in 2005, Fraser fellows Preston Manning and Mike Harris proposed eliminating the federal role in health-care management and financing. Harper has opposed Medicare for two decades. But he responded to the Harris-Manning recommendations by saying, “I could not imagine a proposal that is more a non-starter than that one.” The Conservative party “supports the evolution of the health-care system within the framework of the Canada Health Act”. At least until after the next election, he might have added. Nor will he bring in deep tax cuts for the wealthy–a Fraser Institute staple–until then. But he did follow through on a Hayekian-inspired child-care initiative, which neatly sidesteps “another expensive government boondoggle”, according to an editorial in Fraser Forum. Harper’s plan will “give families choice and help stem heavy-handed government intervention in our lives”. And he did live up to his promise to reject the Kyoto Accord, which has been a Fraser Institute target since before the agreement was signed in 1997. Harper derives only part of his agenda from the Fraser Institute and other Hayek-inspired sources. These are the policies that promote smaller government and less regulation. But there are not enough libertarians to win elections. Harper needs the social conservatives in his tent. And social conservatives want government intervention in people’s lives to enforce the values they believe in: no abortion, no gay marriage, the right to bear arms, a tough approach to crime. Ronald Reagan and George W. Bush knew this. Harper knows it too because he is an evangelical Christian himself. Not only does Harper have to hide his agenda from the Canadian voters, he must balance the demands of the social and economic conservatives in his coalition. Sometimes they want very different policies. Perhaps. But an issue like euthanasia, which was debated at the conference, shows the deep fissures between the camps, one family or not. Libertarians believe they own their bodies and can dispose of them as they see fit. Social conservatives believe that killing someone else, even with that person’s consent, is a sin against God. There can be no compromise. Harper created a Public Appointments Commission as part of his government accountability package. He nominated recently retired oil tycoon Gwyn Morgan to be its chair at a $1 a year. (This was not a hardship for Morgan because he took home $18.2 million in his last year as EnCana CEO.) This commission would oversee the selection of cabinet appointments to government agencies, boards, commissions, and Crown corporations. It would have great influence over the staffing of key government posts. Morgan is a long-time trustee and supporter of the Fraser Institute and a fundraiser for Harper’s Canadian Alliance and Conservative party. In a speech to the Fraser Institute in Calgary last December, Morgan identified the root problems facing Canada: public-sector unions, publicly funded Medicare, and immigration from lawless countries like Jamaica. These were to be Harper’s gatekeepers. But we won’t know just yet who they will let in and who they will keep out. Morgan appeared before the Commons operations-and-estimates committee, where he was rejected by a six-to-five margin. In response, Harper dropped the commission until he has his majority in Parliament. The CanWest papers went berserk over this rejection of a favourite son. The links between the papers and the institute are strong and long-standing. When Conrad Black owned the papers, his wife (Barbara Amiel) and his two business partners (David Radler and Peter White) were Fraser trustees. When the Aspers bought the papers, David Asper joined the Fraser’s board. And some Fraser researchers found perches on the editorial boards of CanWest papers: Fazil Mihlar (Vancouver Sun), Danielle Smith (Calgary Herald), and John Robson (Ottawa Citizen). The CanWest papers have been very good to the Fraser Institute, giving its researchers regular access to their opinion pages and providing extensive news coverage of Fraser publications. Has Harper really changed his spots, or is he still committed to implementing the full Fraser Institute agenda? Have his handlers simply altered his image to make him more attractive to middle-of-the-road voters? Or did his loss in 2004 and his bare minority victory in 2006 convince him that he needs to be more moderate in his views? Only time and majority government will tell.